John Heminway’s portrait of a celebrated physician in Africa with a secret, dark past defies easy summation, so complex and contradictory was Dr. Anne Spoerry. 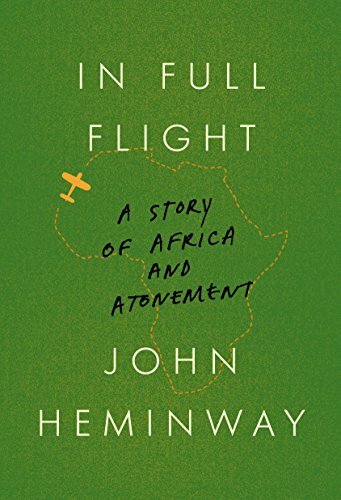 Heminway’s background as a filmmaker serves him well in the pacing of the book, which establishes Spoerry’s heroic status among colleagues and patients in Africa while building suspense with hints of a largely unknown “calamitous error” she made during World War II. Even after the full truth of Spoerry’s life is revealed, this thought provoking story raises more questions than it answers. The first half of the book details Spoerry’s adventures as a colorful and brilliant doctor in Kenya while flashing back to her upbringing in a well-to-do Swiss family. With unmatched efficiency, Spoerry flew her own plane to minister to the sick and injured in far-flung African villages as one of a handful of practitioners known as the Flying Doctors. Common ailments included hyena bites, tuberculosis, and spear injuries. Spoerry’s manner was brusque, her temper easily provoked, and her approach to medicine and to flying totally fearless. Heminway’s description of Spoerry’s privileged upbringing provides few clues to the source of her relentless drive or her decision to live a radically different life in Africa. As a girl she spent her time divided among the family’s grand estates in France and Switzerland. Her devotion to her father and older brother guided her to the point that she dressed and behaved like a boy. Her choice of medicine as a course of study defied social norms of the time and kept with Spoerry’s proclivity for masculine pursuits. She was living in an apartment in Paris and attending medical school in 1940 when German troops invaded the city. Spoerry, who was not Jewish, joined the French Resistance at the urging of her brother. Her eventual capture and internment at the Ravensbrück concentration camp in northern Germany led to the period in the doctor’s life that changed everything, but not in the way you would think. Though heavily foreshadowed, the revelation of Spoerry’s secret—well researched by Heminway through journals, news articles and interviews with Ravensbrück survivors—is a bombshell. It blows apart the impression we have of Spoerry as an adventurer with a tough exterior and a heart of gold. We now know that her career in Africa was not a selfless choice but a necessary escape from the consequences of terrible acts. Heminway presents reasons to revile, pity, and admire Spoerry. Clearly, he sees the doctor’s obsession with treating the most needy patients across east Africa as her way of making amends. Indeed, her tirelessness in treating wounds and illness and providing vaccinations saved thousands of lives. But there are other elements to her Africa story that detract from this picture. In fits of temper she treated those close to her badly, and she would never admit to being wrong. She lived an opulent existence for a Third World doctor thanks to her father’s substantial wealth. Most damning to Spoerry’s character, however, was her refusal to talk about her war experience even decades later. Rather than demur by saying the memories were too painful, she described her time at the concentration camp as “inconsequential,” a grievous insult to those who suffered and died there. It is difficult to accept the idea that the doctor could fully atone without first acknowledging the sin. In addition to an erudite writing style, Heminway throws out place names like Aden and Lamu without providing the context of country or continent. Given Spoerry’s peripatetic existence, first during her youth and the war, then traveling around Africa as a doctor, maps would have been a welcome addition to the text. In Full Flight succeeds as a fascinating character study, a deep ethical quandary, and an engrossing story. Heminway’s treatment of Spoerry is unsparing and honest. It takes audacity to expose a terrible secret about a revered figure, but Heminway does it with care and respect for his subject. He makes clear that despite his revelations, Spoerry’s legacy is safe among the hundreds of thousands she helped in Africa, who still remember her fondly as “Mama Daktari,” Mother Doctor.